- Publisher Dr. Daniel Amen's breakthrough brain-healing program has helped hundreds of thousands to overcome depression, anxiety, obsessive-compulsive disorder, and attention deficit disorder. The maverick author of Change Your Brain, Change Your Life and Healing ADD now presents his proven program for repairing and strengthening our relationships, child-rearing practices, work and study routines, and, ultimately, our soulful connections, in the deepest ways possible. Guided by this book, each of us can learn to balance and optimize the parts of the brain responsible for inner growth, intimacy, and spiritual health. 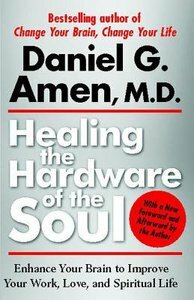 About "Healing the Hardware of Your Soul"